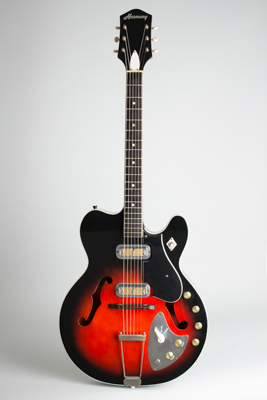 Harmony H66 Vibra-Jet Model Thinline Hollow Body Electric Guitar (1964), Chicago. The Harmony Vibra-Jet is one of the Chicago company's most offbeat and entertaining creations, and a surprisingly practical one as well! Basically it was a slightly less elaborate flat-topped version of the also-new H-74 using an offset cutaway body the company dubbed the "Neo-Cutaway", but with a special addition. This was a miniature transistorized Tremolo unit built right in to the guitar! If you already had an expensive amp without a trem option, this was the answer for you! This was a very advanced concept for the time, especially for the $189.50 price, and an extremely innovative step for the often relatively conservative Harmony company. "Want unusual effects in your playing ? Would you enjoy 'tremolo' at your fingertips, in your guitar, as now obtainable only thru special circuit amplifiers ? Then Harmony's Vibra-Jet tremolo electric is for you ! Enjoy pulsating tremolo through your guitar, not through your amplifier. Built into this handsome neo-cutaway double pickup electric is a skillfully engineered transistorized and miniaturized assembly (made in America) which, at your command, produces a tremolo effect through any amplifier. A lever, in easy reach of your little finger as you play, activates tremolo effect. Adjacent knobs control the speed of the beat, and depth of modulation. The amplifier you play need not to have a built-in tremolo. The built-in double pickups are Golden Tone Indox, designed in cooperation with DeArmond. Each has volume and tone control. A 3 positions switch permits playing through either pickup, or both together, with or without tremolo effect." Apart from the special additional circuitry, the Vibra-Jet is otherwise a good-sounding if fairly unremarkable guitar, with the same basic design and layout of other Harmony thinlines. The neck is equipped with an adjustable truss rod and the pickups and wiring are identical to the Meteor. The built-in vibrato -- which actually works quite well -- is the main attraction here, and this fairly rare model is one of the gems of the early '60s Harmony line. This one dates to 1964 and is a fine playing and sounding example, AND the all-important trem unit actually works! Overall length is 40 1/2 in. (102.9 cm. ), 15 3/4 in. (40 cm.) wide at lower bout, and 1 15/16 in. (4.9 cm.) in depth, measured at side of rim. Scale length is 24 in. (610 mm.). Width of nut is 1 11/16 in. (43 mm.). This is a fine example of this fascinating Harmony model, one of the first guitars to attempt to combine instrument and effect in a single package! It is all original and complete with some overall light wear. There are no notable repairs and the only alteration is the battery connections for the trem have been altered to accept a modern power cell, which is inevitable if it is to remain functional. The guitar plays and sounds as it should, and the variable-speed trem circuit, controlled from the guitar's face, is simply a gas to play with! The first of this model we have had; a cool survivor of Harmony's most creative period. Comes in a good period chipboard case that someone carefully added a large fingerboard reading chart to the inside back of! Excellent Condition.